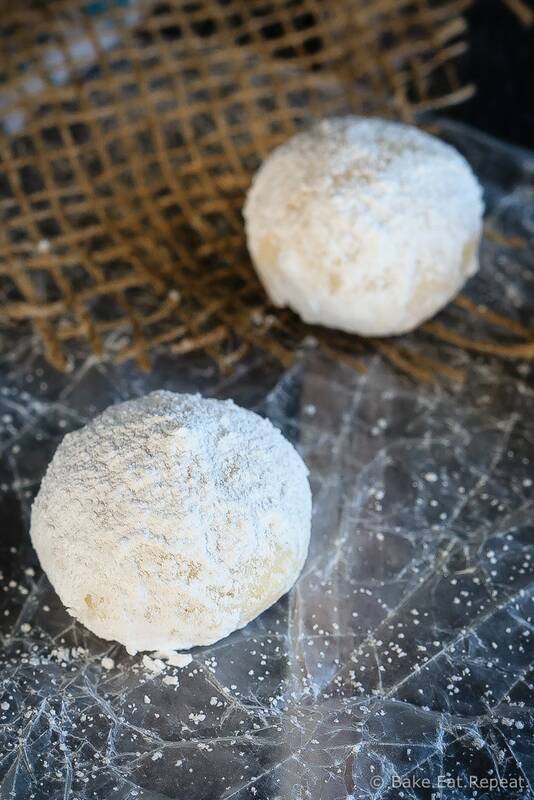 Easy to make, melt in your mouth, almond snowball cookies. These crumbly little almond flavoured cookies are perfect for Christmas! 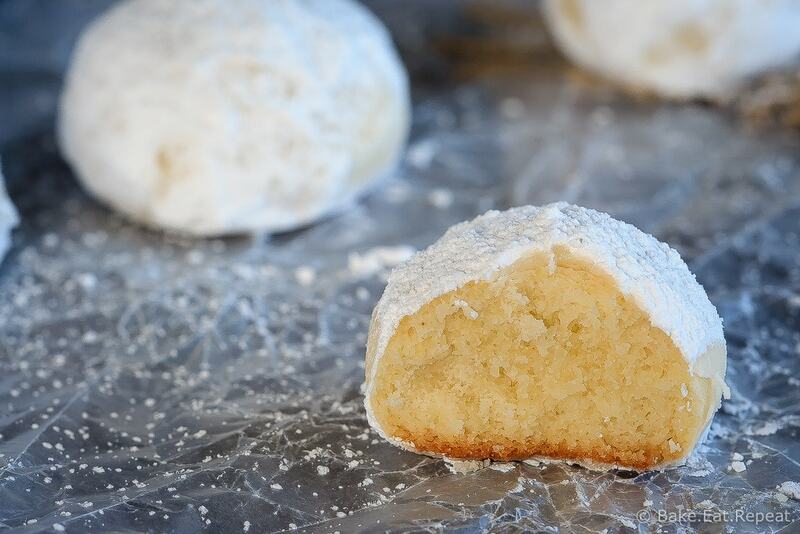 Almond snowball cookies. My favourite kind of snowball cookie. Or Russian tea cake. Or whatever you may call them. 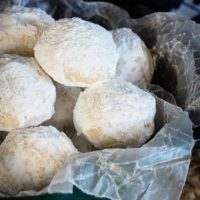 We always called them snowball cookies. And we actually always made them with a candied cherry inside when I was little. But…I don’t really like candied cherries. I still put them on my whipped shortbread cookies, because, well, they’re pretty. And the kids love them. And it’s kind of a tradition. But I don’t like them. They’re just too sweet or something. Although this is coming from the girl that doesn’t like maraschino cherries either, and I know I’m basically all on my own in the world on that one. Everyone likes those things and thinks I’m insane. What can I say – I don’t like them. So I don’t put candied cherries in my snowball cookies anymore. I do, however, still make them almond flavoured like my mom always did. Clearly I have a thing for almond flavouring – I shared one of my favourite Christmas treats last year, this almond cake – and these almond snowball cookies might run a pretty close second. Although….I may just say that about a whole host of Christmas treats. Maybe it’s because we only make these things once a year, but I have a LOT of favourites. Um…maybe we eat too many cookies at Christmas time? Oh well, it’s only once a year. Totally worth it. Anyways. These almond snowball cookies. Cute little crumbly shortbread like cookies flavoured with almond and dredged in icing sugar. They’re the perfect little bite-sized cookie to add to your Christmas cookie list. Especially if you’ve never made them. Super easy cookies to make and oh so tasty. 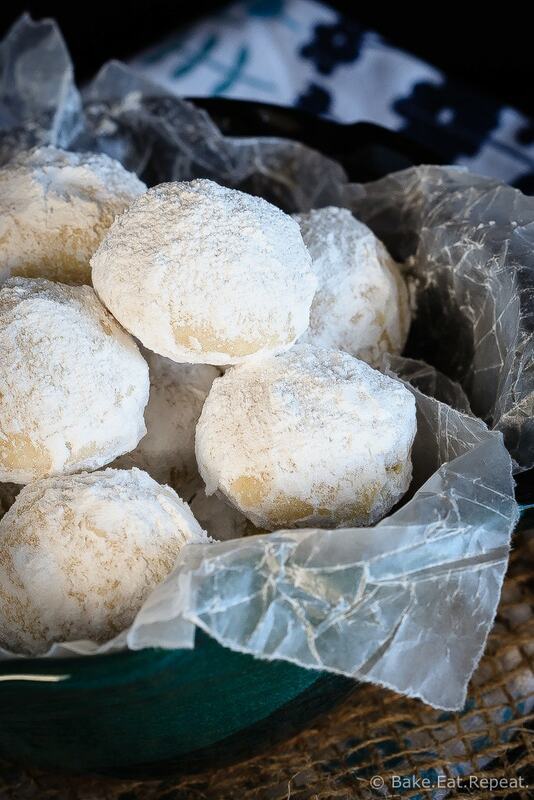 Especially when they’re almond snowball cookies…and there’s no cherry in the middle! Quick and easy almond flavoured snowball cookies make the perfect addition to your Christmas cookie tray! In a medium bowl, stir together the flour, ground almonds and salt until combined. In a large bowl with an electric mixer, or in a stand mixer, cream the butter with the 1/2 cup powdered sugar and the almond extract until well combined. Form the dough into one tablespoon sized balls and place 2 inches apart on a baking sheet. Remove from the oven and immediately dredge the cookies in icing sugar, placing on a wire rack after to cool completely. Once the cookies have completely cooled, dredge them a second time in the icing sugar. Source: Adapted from Ricardo Cuisine. So glad you liked them Darlene! Thanks! Hi Ashley - the first 1/2 cup of sugar is added in step #2 and creamed with the butter. The other 1 cup of sugar is used for dredging the baked cookies twice (step #4), once when they're warm and again when they're cooled. I've never heard of "icing sugar". Can I use granulated sugar? Hi Susan - it's also called powdered sugar or confectioner's sugar depending on where you are. I'll add that in to the recipe, I usually put both, just forgot this time! You can find it in the baking aisle with all the other sugars. I love snowball cookies! I think they taste so good because I really only have them at Christmas. And I agree, I'm not a big fan of cherries in things, only on top, like your other cookies! These almond cuties look SO good, Stacey!